What is the MMD accessory mode? What’s new in MMD 8.03? Is there anything new in MikuMikuDance 8.03 that wasn’t in 7.39? How can I position MMD Accessories on my model? 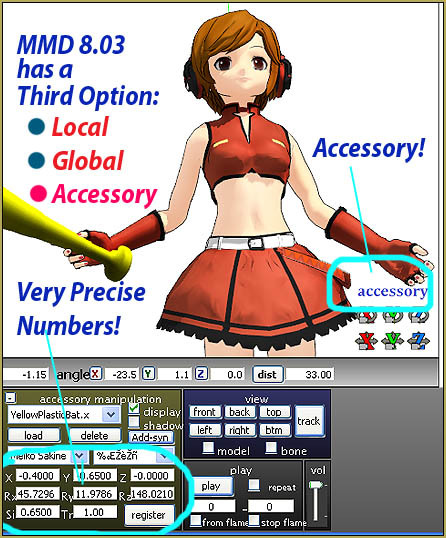 MMD Accessory Mode was NEW in MMD 8.03! There was a feature introduced in MMD 8.03 that was NEW … was not a part of MMD 7.39 … a third “bone/manipulation mode”: Accessory. NOW you can load an accessory and affix it to your model in the AMP (accessory manipulation panel) … go to the X-Y-Z rollers, click Local – Global – Accessory (gasp) … and drag the rollers to move that accessory to exactly where you want it. No more guessing about which number to try next! Keep making slight adjustments until you see it right where you want it … and then REGISTER. Wow … look at the precision of those position numbers in the AMP boxes. You’d never use numbers like that in MMD 7.39. This is a real improvement over good ol’ MMD 7.39. Using the Accessory mode really speeds-up the animation process. A BIG THANK YOU to the folks at VPVP! I can’t make the accessory show up in the files, PMX and PMD. so what am i doing wrong? Accessories are loaded through a different panel, not where PMX and PMD are loaded. I try this with a guitar, but did not work. The guitar was in the right place, but when I put play, it moved a lot, the center of the guitar was perfect, but the hand for the chords was completely out of place. How do I can attach the guitar to his hand too?? In my experience, you have to keep moving the hand to keep-up with the guitar … or adjust the guitar to keep up with the hand “:o). … moving the hand to fit the guitar is part of your animation. The accessories I put on my models aren’t moving with them when they dance. Help, please. Attaching an accessory to a model “just has to work” … Do you place the accessory on the model and then REGISTER right there in the AMP (accessory manipulation panel)? … If you forget to register, the accessory will snap to the floor as soon as you move to the next frame or push play. … But if you load an accessory, attach it to a model, register … the accessory is, essentially, now part of the model … it simply must move with the model’s motions. For some reason, when I turn on Accessory mode, only angle manipulators Rx, Ry, Rz do rotate the item as intended, but position manipulators X, Y, Z still move the camera instead. Is this normal for this mode, or I’m doing something wrong? O my god!! I did not know that. that is so cool. Last night I was trying to positioning an accessory in the hand of a model for the 0 to 450 contest. I must have spent the hole evening trying to get it right. Finally went to bed. wishing there was an easier way.